Your outdoor living area should be a space of relaxation and beauty; one that encorporates the functionality and convenience of modern living but also showcases the natural beauty that surrounds you. Teak patio sets, complemented with a teak chaise lounge, allow your outdoor living area to seamlessly blend with your landscape while providing the seating, storage, and shelf space you need. Modern, beautiful, durable and comfortable. Our line of outdoor teak furniture compliments any outdoor setting, providing luxurious seating options that impresses any and all of your guests. Relax in the sun knowing that the teak furniture you've invested in, not only adds functionality to your outdoor space but will do so for years to come. Naturally water resistant, teak wood is highly durable and all AquaTeak® products are backed by our 5 year warranty. 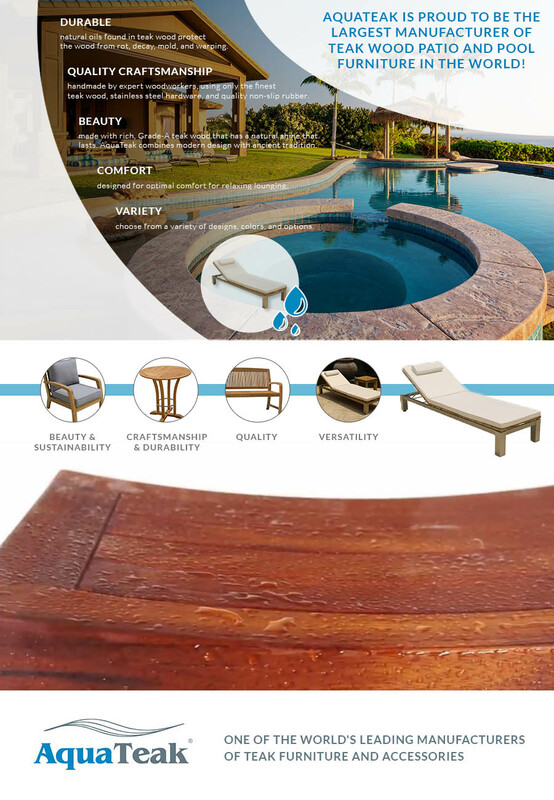 AquaTeak is proud to be the largest manufacturer of teak patio furniture and pool furniture in the world! The natural oils found in teak wood make it waterproof and weather resistant, which protects the wood from rot, decay, mold, and warping. Over the life of the wood, it does not lose the natural teak oil and continues to hold up in even the harshest of environments. In fact, navies and yacht owners around the world have valued it for centuries. This make our outdoor furniture collection ideal for use on your patio or deck, in the garden, on the lawn, or poolside. At AquaTeak, we take pride in the quality and presence of our teak furniture. Each piece is handmade by expert woodworkers, using only the finest teak wood, stainless steel hardware, and quality non-slip rubber. Before our furniture makes it into the homes of our customers, it must pass inspection to ensure you end up with only the highest-quality pieces of furniture. All of our teak wood furniture is made with rich, grade-A teak wood that has a natural shine that lasts. AquaTeak strives to make unique furniture that combines modern design with ancient tradition to accommodate any decor motif. If the wood does begin to look weathered, a simple coat of teak oil will restore it to its original impressive sheen. No piece of furniture would be worth it if it was only nice to look at. That is why all of our teak furniture is designed for optimal comfort for relaxing lounging. Whether your pool guests are using our lounge chairs or you are recovering in a steam shower, you can rest assured that your AquaTeak furniture will provide superior comfort. Made to be used and enjoyed, all of our designs are created with comfort in mind. AquaTeak is known for our teak wood shower benches. However, with 12 collections of teak wood furniture that feature more than 100 individual pieces to choose from, there is an endless variety of designs, colors, size and accent options. Add sustainable, elegant furniture to your outdoor decor, shop our entire line of teak outdoor furniture today!